Part one of my report on the tour of ancient sites in southwest England. In which I learn how the visitor's participation animates the power of the sites in their role as temples. 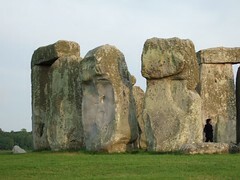 Of all the iconic landmarks that could represent England, I was most attached to Stonehenge. Its mystery kept alive something that history hadn't managed to categorize and box up. It dominated the landscape, despite being bound on two sides by noisy highways. To the average visitor it was cordoned off and had to be viewed from a distance, but Freddy Silva, our tour leader, had promised that we would have complete access to the stones. 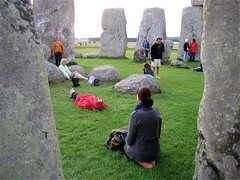 And though there were so many of us that we had to enter in two groups of 26, we would all have an hour at sunset to absorb the mystery held within the circle of stones. Catherine and I were in the second group. We stood on the path feeling the stones from afar. And we could feel it too. I hadn't known to do this on previous visits, but having practiced feeling for energy forces emanating from individuals in my Shamanic healing workshop, I was enthralled that this sensation was so defined against my palms, like a wall of buoyant energy. 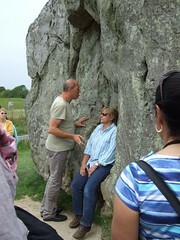 I was too hard of hearing to hear the high pitch sound given off by the stones, but Catherine could hear it. Both of these phenomena Freddy had mentioned we might sense. Since this tour was a part of my Shamanic exploration, I came prepared to dance my spirit animals at the site. I had my iPod with me and began to do a jig of sorts, much to the amusement of Catherine who was taking video pictures of me (and listening to her own iPod—to a Buddhist dharma talk). Then we hung out on the grass, on this clear evening, watching the first group mingle about among the stones. After a while, I lay on the ground to attempt a shamanic journey, but I couldn't do it; the site appeared to be protected underground by a rigid replica of the stones and I was unable to proceed. Just at that moment Catherine was telling me to get up. It was time to go in. And so he told us the story he espoused, about how Stonehenge came to be built by a race of Egyptian builders—giants who were some twelve feet tall—who came to Britain circa 8,000 B.C. as part of a temple building boom after a global flood. Said builders had levitated the stones into place. In England this levitation story is popularly attributed to Merlin. I was familiar with discussions of levitation from other New Age literature, but giants—not so much—apart from Jack and the Beanstalk and Haggard in Harry Potter. These builders were "dedicated to the preservation and transmission to the future, of a body of spiritual knowledge from the remote past," Freddy says in his book Common Wealth. They wanted to "maintain an unbroken chain of self-help centers in the face of potential chaos…because temples are living organisms that amplify human potential". It was the part about amplifying human potential that had excited me enough to make this journey across ocean and continent to see for myself. Curiously, once inside the circle, I could no longer feel the electromagnetic force. The stones seemed quiet and protective. Later I would learn that the site was designed in such a way that an electromagnetic field was created around the perimeter to protect it and to alert those who knew how to use such sites. Perhaps that was why I couldn't journey outside of the site. And why I was seeing a picture of it all locked up. Duh. Stonehenge was originally intended to be a lunar calendar, Freddy told us, which was why the blue stones used to be outside the circle of larger stones, but when the climate changed, the ancients moved the stones inside to adapt to the new solar oriented climate. Thus mankind went from a feminine culture (governed by the moon) to a masculine culture (governed by the sun). That's for sure, I thought, but I'd not heard it attributed to a change in climate. Even more interesting was the healing properties that Freddy mentioned was associated with the stones through sound. Sound was a method healers used to put the human body back into alignment. This coincided with recent information I had learned about the use of sound to open the chakras for healing. Sound was a tool we would use to raise the level of energy within the site; this would make it easier for us to access what the site had to offer, Freddy told us. He then instructed us to find a note that we felt emanated from the stones and sing it. This was called toning. I'm not much of a singer, but I did indeed feel that the note I picked was true to the stones; it was also in harmony with the rest of the group. He then suggested we look around and find the stone that was calling to us, go to it and see what it had to offer. He encouraged us to "go with the faeries" as we did this. In his own way, he was speaking in shamanic terms. The best way I knew to access knowledge from an "inanimate" object was to use a fluid mind—enter the dreamscape with my spirit animals. Standing before a large stone on the perimeter, I meshed with Mongoose, climbed up to the top and asked for a vision of the future. I saw a man in a horse drawn cart coming down a dirt road. He looked like Igor from the movie Young Frankenstein. "You've been reading too many peak oil books", I said to Mongoose, and climbed down again. At the next stone I meshed with Bear, climbed up to the top, looked at the sky and saw a space ship by twilight. Well now, this was more fun. I stayed there waiting and a hatch opened. A humanoid alien walked down the gang plank, put out a finger and touched me then returned to his ship and took off. Having got the obvious visions out of the way, my mind was emptier of expectation. I approached a small stone about waist high. I had Mongoose touch it. (We were not allowed to touch the stones; it made the guards anxious.) The pint size stone started to dance and reminded me of Silly Putty, a favorite toy I made my parents buy me when I was ten. What had entranced me about Silly Putty was that you could press it onto a newspaper and take from it an imprint. The stone was telling me it was a publishing stone. Good enough; I had friends telling me to publish and now a stone too. Behind it was a taller stone with a tiny hole where an eye might be. It told me it was a reporter stone and received massive amounts of information through his one eye. This visual amused me so intensely, I was satisfied that I had found the right message. I sat back and watched a crow fly to the top of the lichen encrusted stones. He caught a wasp buzzing about there and ate it. The sun was setting. It was time to go. As we left the site, a woman in our group came up to me. "I love your energy", she said. This is New Age speak for I think you're hot—on a cosmic level. "Are you Native American?" she asked me. Ah, she was fooled by the feather in my hat. I told her my background and asked her where she was from. 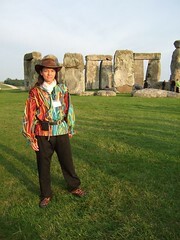 My outfit for Stonehenge was purposefully flamboyant. For the trip, I had sewn a shirt from fabric so full of colors it looked like a Rousseau jungle. The shirt had a floppy collar and wide medieval sleeves ending in elastic clown ruffles at the wrist. (Very useful for pushing up the elbow when the day turns warm.) To the open V neck collar, I could add my white aviator scarf when the nights got chilly. I wore the shirt like a tunic with my black belt with the sun ray brass buckle (made by a craftsman in San Gimignano from our visit to Italy). Worn with black pants, it was, all in all, a swashbuckling effect. When you can't blend in, you might as well stand out. It makes people consider twice before pigeonholing you. To complete the outfit I had to have a hat. If I was not to be English (for I knew the English did not hear my accent as English), then I might as well be American. This called for a baseball cap or a cowboy hat. The closest I had to a cowboy hat was my leather Australian Bahmah (also perfect for rainstorms). My mother noticed the feather poked into the hatband when she came to take us to the airport. She commented on it being shaman like. Indeed, it was the final shamanic touch. It was a turkey feather, often used by Native Americans in their ritual ornamentation. I found the big, brown and white striped feather on a recent camping trip to Henry W. Coe State Park. There you can hear the wild turkeys gobble as you wake up. They left me the feather on the trail near the campsite. "It's all about the hat," I told my mother as I put it on my head for the ride to the airport. In the next few days I would get to know the tour members. Many were professional intuitive counselors, astrologers, channelers, healers, Reike practitioners, massage therapists plus an accountant. The tour leaders referred to us as prophets after the name of their conference. It was not altogether a misnomer. I had been "prophesying" doom for some years now. At Avebury we gathered at the very long procession of what was originally 600 stones standing in two lines about 20 feet apart. The pairs of rocks were designed to wake up the entering initiate as electromagnetic energy bounced between them. The site was on two ley lines known as the Michael and Mary line (or in pre-Christian times as the Apollo and Athena line). The stones on the left guarded the female line and the ones on the right, the male line. Several of the prophets said they could feel the pulsing between the pairs of stones. I couldn't feel it, but I was used to being the dumb one in the group. For his next demonstration Freddy called for a volunteer. We had, by then, entered the main field where the stone circle lay. We were at a very large female rock at the entrance of the circle. It had a seat in it where the volunteer would sit. Once she did so, Freddy scanned her with his hand to discover the site of the ailment (as I had learned in my extraction healing workshop). He held his hand there and toned the appropriate note into the rock face. At the top of the "sound" chamber the rock jutted out capturing the sound and sending it back down to the patient. "I can see her chakra expanding," said one of the prophets with a North American accent. "Ah good so it's working," Freddy said. Later I spoke to the woman who could see chakras and asked if she was an intuitive. She said she had been able to see auras since quite young and was giving classes when she was thirteen, but there was not much money in intuitive work so now she was a coach. Hmm, yes, join the club. On the third day, of the tour, we followed just the Mary line for we were devoting the day to getting a feel for the feminine energy. And what a lovely day it was for taking in the sites. 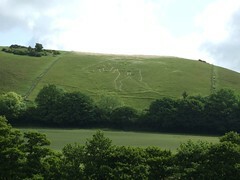 First a fertility site where the Cerne Giant with his impressive phallus was etched in the hillside with lines of white chalk. 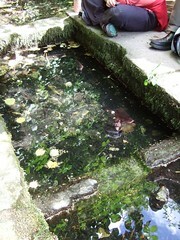 Then a visit to the Cerne Well in a quiet walled garden behind a church. As we sat in the dappled light under the trees, Freddy encouraged us to enjoy the contemplative environment and to drink from the stone basin in the ground at our feet. The water was full of iron and was good for us, he said. We would also be drinking the memories of all those who came before us which would connect us to the past and future. The water was cool and thick. It had been a long time since I could drink water directly from nature. This, I thought, was the perfect place for a shamanic journey and just as I picked my intention for the journey (to help me further bond with my two power animals), a German woman, not from our group, spoke up and announced that she was going to lead a shamanic journey and anyone who wanted to could join her. I looked up to see a large, bespectacled woman in a poncho and a hat much like mine. In her hand she held a handmade skin drum. How serendipitous was that? I put my face in my hat to block the light and she began to drum exactly the beat that I was accustomed to. And so we three spirit friends, Bear, Mongoose and I set off on a fast ride in a dinghy up the Cerne spring. We were enjoying the open countryside when the spring led us into an underground tunnel behind the Cerne Giant. We then came to a large wooden door. The drum bid us enter and we walked into a sun filled village peopled with celebrants. Following the path we came to a rock face from which water poured forth. A pretty woman in period dress and flowers in her hair stood beside it. She handed us each a crystal goblet and bid us drink. This we did and were thus refreshed and bonded in this ceremonial pilgrimage to the wellhead. Just then the drum sounded the beat of return and we hurried back the way we came, boat and all. It was such an invigorating journey it filled me with magic. Afterwards I got up and introduced myself to the German shaman, exchanging a few words about our shamanic traditions. 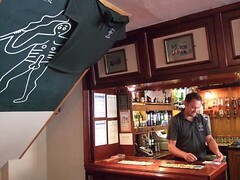 For lunch there were two pubs to pick from, The Royal Oak and The Giant Inn. Naturally I picked the Giant. Soon other prophets joined me, ones I recognized for their high level of intuitive skills. When they asked what I did for a living they were fascinated that I went into people's home to do actual clutter clearing. How funny, I thought, for their work was equally exotic to me. Another prophet, an Englishwoman, sat down next to me and bid me tell her about the feather in my hat, asking if it was an eagle feather. She also wanted to know what was up with the red rock lobsters on my bright yellow shirt. I explained about the turkey feather and told her how I had made the shirt from a vintage Hawaiian sarong (in the same style as the Rousseau jungle shirt). This seemed to past muster and she proceeded to speak to me as a peer. She was a channeler, she said, as if describing an ordinary job. (I love that down-to-earth quality of the New Age Brits.) I asked her how that was different from a medium. She said mediums just work with dead people. She used to do that, but dead people weren't any wiser for being on the Other Side and she was tired of them leaving footprints on her psyche. Channelers, she told me, work with the energy of the earth, Gaia for instance, to ask her to be gentle with her back cracking which we experienced as earthquakes. She asked how San Francisco had managed to avoid having an earthquake, because from where she stood, one was due, what with all the earthquakes happening in Japan and all. "I don't know", I said, "all of us who live there are nuts." For living in earthquake country, I was thinking. "It probably feels good living there", she said, "because of all the negative ions coming out of the cracks in the earth". I hadn't thought of that. "We'll you must be doing something right," she concluded. Yes, according to Gaia relationship theory, we must be in her good graces. I liked to think so with all the weekend events I went to to improve things with the planet. 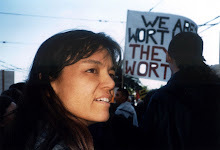 She told me about brokering deals with unfriendly spirits that harmed the environment. It sounded so much like what I'd been reading about possession by unwanted entities, I told her about my hoarding clients. She said I should do space clearing after I decluttered my clients' homes. "I'm not really trained in space clearing", I told her. "It's more the department of my Feng Shui colleagues." "I'm giving you a hint," she said adamantly, not put off by a lack of credentials. "And you should change your name to Ananda," she added. This was a Sanskrit name also used in Thailand. Perhaps she had changed her name too, I wondered later. She had a Celtic one with a handful of vowels. I heard it as Elfa. When I told Catherine, that evening about Elfa's suggestion, she reminded me that Ananda was also the companion to the Buddha. Yes, I remembered. He was the dumb one who didn't get what the Buddha was going on about, asked a lot of questions and wrote everything down. "Well, that sounds about right," I said.